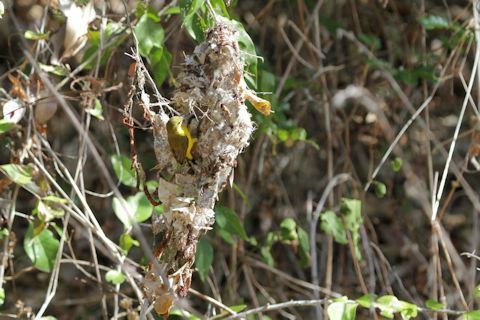 A female Olive-backed Sunbird building her huge nest (relative to her anyway). Perhaps the male helps but I didn't see him pitching in. I did observe him call the female away from her manual labour on one occasion to where he was perched in a shady bush but the observed purpose was to help ensure that she would need a nest. With no time for a post-coital cigarette, she immediately returned alone to her construction tasks.